News continues to grow regarding regulating Loot Boxes and their impact on game design, monetization, and consumer behavior. At this point, we must be in the hundreds as to videos or posts decrying the use of loot boxes. However, it’s important when studying loot boxes to look at why they’re so popular, and when the line gets crossed into predatory practices. A loot box is considered any microtransaction purchase where the player is spending money for an unknown (or mostly unknown) good. These goods can vary from cosmetic items to gameplay enhancers. The important point is that unlike a traditional purchase, the consumer does not know exactly what they’re getting, and these purchases are designed to be endless. Within the loot box itself, the chance of each item appearing is dictated by the design, and the player may or may not know the chances (which is a debate in of itself). Many defenders of loot boxes will try and equate their use to the concept of “loot piñatas” from ARPGs. The problem with that comparison is that earning loot in ARPGs is all done through play, and due to the procedural nature of the design, you cannot attach a value to the goods. With that said, let’s talk about why loot boxes are effective in driving engagement and purchases. Besides free to play/mobile games that have made use of loot boxes, we have seen retail-based experiences use them in varying degrees. Regardless of their implementation, all loot boxes have the same elements that make them attractive. The first part is the anticipation and build up of opening them. Every loot box has an in-game representation — with different loot boxes having a different look to them. The buildup of knowing that you are about to get something is akin to opening up a present, but with added special effects. Just like a slot machine, many titles that use loot boxes will show you what you COULD get along with the winning item. For retail games, loot boxes are typically rewarded after winning a match and serve as the prize for a successful play. In Warhammer Vermintide 2, the quality of the loot box is determined by how well the team performed, and more importantly, if they managed to survive the level. Having the loot box be the icing on the cake in a retail game is different from being the centerpiece for F2P and mobile titles. For them, the purchase of loot boxes is the only way for the player to grow in power — there are no alternatives. It doesn’t matter how great the player is if they’re not getting/can’t afford the items they need to continue. While many supporters of loot boxes don’t see any issues (we’ll talk more about those in a minute,) more countries are looking into regulating the use of Loot Boxes akin to the gaming industry. No matter how you dress them up, loot boxes are akin to slot machines in terms of their design and application. The person puts money in, and they may or may not get something of equal or greater value. A common defense is that the person is always getting something, and hence, it can’t be considered gambling. Unfortunately this argument breaks down the longer someone plays a game with either fixed loot boxes (IE: All content from the loot boxes are hard coded) or an endless chase. The first point is when we’re dealing with resource-driven design — Clash of Clans, South Park Phone Destroyer, Marvel Strike Force and so on. In these titles, the only way to grow more powerful is to level up your characters/cards/etc via in-game resources or additional copies of said item. The more you play these kinds of games, the pool of viable rewards shrink based on what’s required. If I need resource A, B, and C to upgrade my team, and the loot boxes are not dropping them, then I’m just wasting my money. For titles that either allow you to mill resources or earn them through in-game play, we can see issues where the scale of time: money is not properly balanced. Yes, you could earn that rare item that you want, but it may take dozens (or hundreds) of hours of play…or you just spend $25 right now. 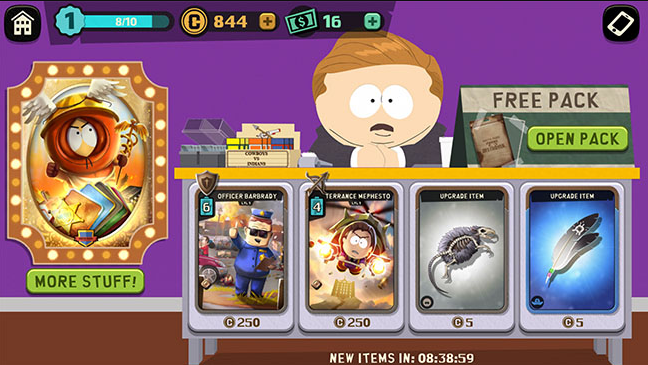 F2P games that make use of loot boxes may begin at a zero cost, but high level play can quickly balloon to spending hundreds of dollars to remain competitive. As we said in the last section, the design team has all the control over the rarity, content, and most importantly: the pricing of every loot box sold. With that amount of control over pricing and content, it’s easy to see how much focusing on loot boxes can impact a game’s design. Last year with Middle Earth:Shadow of War, a lot of talk went into discussing the game’s final act and how it was over-tuned against the player to promote the loot box system. This backfired so much, that WB Games was forced to remove loot boxes and rebalance the game similar to EA's situation with Star Wars Battlefront 2. The effectiveness of loot boxes cannot be ignored and how well they are at driving people to spend money. There is huge money in creating engaging purchases in video games, but how much is it helping a game’s design? For many people who don’t like loot boxes, they seem them along the lines of the design of slot machines to keep the money flowing. They’re not designed around making the gameplay better, and often make it worse, as we talked about above. As with gambling, the temptation is there to pull in people who are susceptible to addiction. With that said, I know defenders will point out below that you can’t take into account everyone when designing your game, but that doesn’t mean you should leave those elements in. If we (or the governments of the world) are going to take a stab at regulating loot boxes, then we need to set some ground rules. For the ones only earned through gameplay, we’re not looking at them, as there is no money involved. The big question is how much regulation should there be on points two and three? When dealing with fixed goods, there should come a point when someone will acquire all the content and will not need to spend any more money. For those titles, we need to look at how much and how long it would take and figure out a balance. Last year with Ubisoft’s For Honor, it was estimated at launch that it would take someone about two and a half years, or $732 on top of the original purchase to get everything. That value is no longer accurate, as the game was rebalanced following the backlash, but you get the point. When it comes to consumables however, they are inherently designed not to have a limit, and are meant to be purchased infinitely. As long as the designers continue to scale the progression model up, there will always be a reason to keep spending money. I feel that these are the most predatory, and quite frankly, serve no advantage to the consumer. And when you combine that with the developer having free reign to set the price and control, it’s too much in my opinion. A major part of the problem in Shadow of War was that not only did you have to rely on loot boxes to build your army, but your characters could have been killed — wasting the purchase. And the phrase “wasting the purchase” is a big part of the problem with a lot of loot box and microtransactions in video games. Far too many games allow consumers to waste their money thanks to the RNG of loot boxes. As this post goes up for people to read, the discussions about monetization and loot boxes in the game industry continues to grow. Last year signaled the push back by consumers against the practice in retail games; this year marks the governments of the world starting to take a serious view on it. Whether it comes from inside or out, the time is drawing closer to take a hard look at how much monetization and loot boxes are impacting design and consumers. What kind of regulations do you feel would be acceptable for loot boxes?